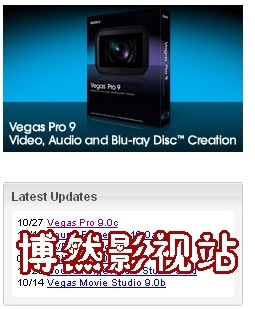 博然影视站〖Sony Vegas 讨论区〗〖影视后期讨论区〗隆重推出Vegas pro 9.0C，粉丝们 该入手了！ - Powered by Discuz! LONDON — Europe\'s leading Imaging and Sound Association has awarded Sony Creative Software winner of the European HD Video Editing Solution category for Vegas™ Pro 9. 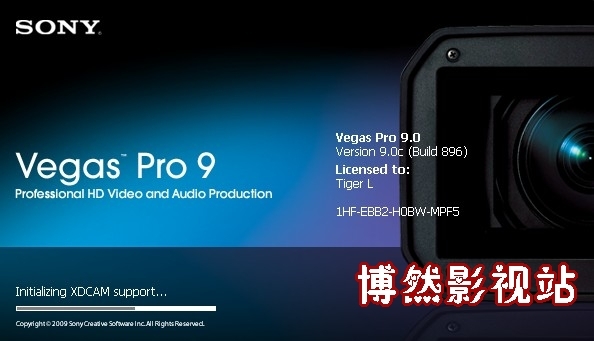 The EISA Judging Panel commented: \"At a price that\'s affordable for amateur video enthusiasts, Sony\'s Vegas Pro 9 gives you a full professional editing solution. It is easy to use, and at the same time covers an unlimited number of audio/video tracks and a large range of video formats, including DV, HDV and variety of AVCHD formats. Additionally Vegas Pro 9 handles professional formats like XDCAM, SD/HD-SDI and RED 4k. You can mix 5.1 audio, and for thorough colour grading you can extend your editing suite with an AJA break-out solution, showing the video picture on a real TV screen. The software works smoothly on a normal, powerful PC. And if price is still an issue, you can choose one of the much cheaper Vegas Movie Studio packages with limited specifications, yet sharing the same professional, but still easy, user interface.\"
EISA is the largest editorial multimedia organisation in Europe, with a membership of nearly 50 Audio, Mobile Electronics, Video and Photo magazines drawn from 20 European countries. This year\'s award winners were selected after the deliberations of a judging panel comprising journalists and independent technical experts. Dave Chaimson, VP of Worldwide Marketing of Sony Creative Software, says, \"It\'s an honour for Sony Software to be recognised by not only the consumer, but by industry professionals as well. As the number of video and creative amateurs continue to grow, it\'s important that all their requirements are catered for, to enable a high quality standard of work at an affordable price\". The EISA judging panel also commended five other Sony products including European Personal Media Player (WALKMAN® NWZ-X1050/1060), European Compact Camera (Cyber-shot™ DSC-WX1); European HD Camcorder (Handycam® HDR-XR520V/ XR520*); European Zoom Lens (G Lens 70-400mm F4-5.6 G SSM); and European Video Projector (BRAVIA™ VPL-VW85). \"Our best-ever result at this year\'s EISA Awards proves that Sony\'s innovation is flourishing,\" said Fujio Nishida, President of Sony Europe. \"It\'s an honour for the efforts of our designers and engineers to be acknowledged in this way by a European publishing association that enjoys such a fast-growing worldwide reputation. At Sony we are more focused than ever on creating new products that deliver a fantastic experience for our customers. We\'re delighted that the EISA judging panel has endorsed our efforts with no less than six separate awards for Sony.\"
The 2009-2010 EISA Awards will be presented at a special Gala Event in Berlin on the 4th of September 2009. Vegas Pro 9 software is available at retailers worldwide and for purchase online at www.sonycreativesoftware.com. Manufacturer\'s Suggested Retail Price (MSRP) for Vegas Pro 9 software is U.K. ?79 (incl VAT), localised French, German, Spanish, and Japanese versions are also available. Sony Creative Software inspires artistic expression with its award-winning line of products for digital video, music, DVD, and audio production. Sound Forge, ACID, and Vegas software have defined digital content creation for a generation of creative professionals, amateurs, and enthusiasts. These signature product lines continue to advance the art of providing powerful, accessible tools to unleash the imagination. Today, there is a Sony Creative Software application for every level of expertise, including a full line of consumer software based on the company\'s professional applications. In addition, Sony Creative Software produces the extensive Sony® Sound Series collection of royalty-free loops and production music, Sony Pictures Sound Effects Series exclusive sound effects, Vision Series video creation assets, as well as www.ACIDplanet.com, the internet\'s premier site for independent music and video artists. As a subsidiary of Sony Corporation of America, the company also develops applications that enhance the experience for users of Sony hardware devices including the PSP® (PlayStation®Portable) and Sony Ericsson mobile phones. Sony Creative Software customers span the globe and include seasoned professionals in the film, television, video game, and recording industries, students and educators, hobbyists and enthusiasts, and young children exploring music creation. Enhanced audio event timestretch and pitch shifting with zplane élastique Pro. Added XDCAM EX (MP4) rendering. Added quality setting for MXF compression during capture (lower quality level enables compress during capture on lower-end hardware). Added a Prioritize quality over speed check box to the MainConcept MPEG-2 and Sony MXF Custom Settings dialog. MPEG-2 smart rendering now works across different container formats. You can smart render between identical operating points of XDCAM (MXF), XDCAM EX (MP4), and HDV (M2T). Added support for RED devices and media to the Device Explorer. Incorporated an updated RED SDK. In the new SDK, default decoding properties have changed, and color science has been improved. You may notice variations in decoded images due to these changes. Added support for additional AJA I/O hardware: XENA LHi and Io Express, including HDMI input and output. Added support for BlackMagic Design DeckLink HD Extreme (4:2:2 only). Improved precision for the Record Engage Delay setting when printing to tape from an SDI device to allow fine tuning of auto-edit frame accuracy. Added General Preference for Import stereo as dual mono which allows for working with two-channel audio as dual mono. When using this setting, the default panning mode, Add Channels, will increase the level of mono events by 6 dB, which can cause unexpected results in your mix. We recommend using the Film or Balance (0 dB Center) panning mode when using the Import stereo as dual mono setting. Added UMID reading for XDCAM EX (MP4). Improvements to XDCAM (MXF), HDV, and AVCHD readers and writers. Fixed an issue where XDCAM EX essence markers were not displayed for clips imported using the Device Explorer. Fixed an issue reading QuickTime audio when using QuickTime 7.6.4. Fixed a crash when displaying the Audio tab for QuickTime templates when using QuickTime 7.6.4. Fixed an issue that could cause certain large clips of XDCAM (MXF) audio to have small dropouts. General compatibility improvements to XDCAM HD MXF files. Fixed and issue with smart rendering MXF/DV content to AVI/DV format. Fixed an issue with saving a project with trimmed MXF/DV media. Fixed an issue where the audio proxy for nested projects might not fully render. Fixed a crash that could occur while creating a custom AVI render template. Improved audio/video sync in Sony AVC and MainConcept AVC. Fixed an issue with AVCHD markers not appearing in the correct location. Fixed a hang that could occur rendering AVCHD with AC-3 audio. Fixed an issue reading certain AVC files (64-bit version). Fixed an issue creating a template with a custom bit rate in MainConcept AVC/AAC. Fixed an issue rendering certain projects to MainConcept AVC/AAC (64-bit version). Fixed an issue with removing 2-3 pulldown from AVI/DV 24p sources. Fixed an issue that could cause the Windows Secondary Monitor to display incorrectly after performing a prerender. Fixed an issue with prerender or print to tape to certain progressive formats when media generators are used without effects or compositing. Fixed an issue that could cause a glitch in the audio if two envelope points were at the same location. Fixed image preview during HDV capture (64-bit version). Fixed an issue where 64-bit VST plug-ins would not appear (64-bit version). Fixed an issue that could cause the Vegas90.exe process to remain in Task Manager after closing Vegas (Windows XP only). Fixed Project Media window Timecode In/Timecode Out fields to not use project ruler offset. Fixed an issue that could cause events created using Render to New Track to be misaligned if Quantize to Frames was enabled. Fixed an issue that could cause the Add as CD Track command to create events without media for some file types. Fixed an issue with setting the recording path in the Project Properties dialog. Fixed an issue that could cause Open Copy in Sound Forge to change the audio bit depth of the resulting take. Fixed an issue with DPX file row padding. GMT+8, 2019-4-26 23:59 , Processed in 0.881074 second(s), 32 queries , Gzip On.